Just want to thank you all for your lovely comments on my previous post, I'm feeling a lot better about 'The Denim Flower' now. Unlike my previous card this one came together really quickly. Funny how that just happens sometimes. 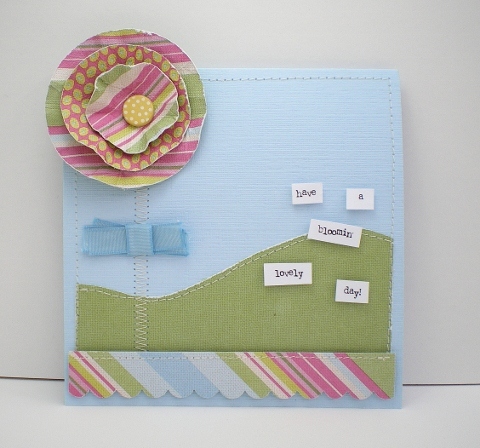 I'm sure it was helped by the fab sketch I used - Sketch 118 over at Card Patterns. I've been revisiting my stash of patterned papers, it's all part of my class 'Something From Almost Nothing'. This mat pad was the very first patterned paper pad I bought, K&Co Amy Butler Belle, and it's still one of my favourites. Vicky, this is stunning. I too have those papers and have stroked them for well over a year now!! 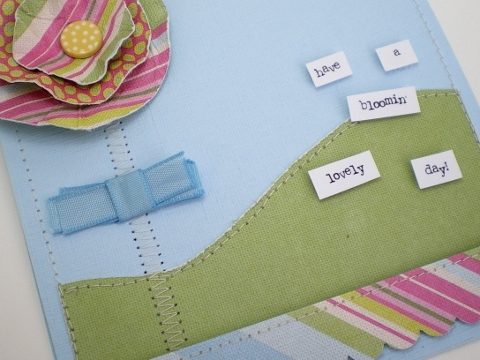 Love what you've done with the delish Amy Butler papers! Thanks for playing with us at Card Patterns! I love this card, it's so fresh and very summery! It's actually quite liberating using up your old stash, I thought it would kill me to use the things I love the most but it's actually giving me pleasure! So 'sew' pretty - love the flower and I agree those papers are beautiful. You always treat us to such wonderful original creations. I love Lynda's comment...perfect for this piece and you just keep amazing me with your creativity. Absolutely lovely work and so creative! What a pretty card! Love the sentiment and the papers are fabulous!